The PSHBU40 series of AC DC open frame medical power supplies offers up to 40 watts of output power in a 4″ x1″ x 1.28″ unit. 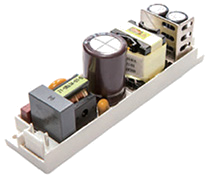 This series consists of single output models and a wide operating voltage of 80 to 275VAC. Each model in this series has an ultra-low earth leakage current and is protected against short circuit and over load conditions. 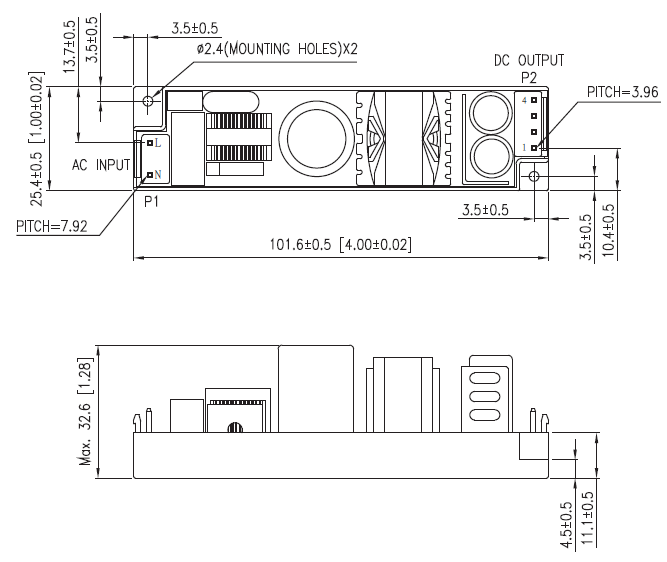 This series has IEC60601-1 edition 3.1, ES60601-1:2005(R2012), CSA C22.2 No. 60601-1:14, EN60601-1:2006/A1:203 safety approvals. Notes: (1) Output is at factory setting and cannot be adjusted. (2) Output can provide up to peak load when the power supply starts up. Staying in more than the rated load continuously is not allowed. (3) Each output is checked to be within voltage accuracy at factory in 60% rated load condition. (6) Ripple & Noise is measured by using 20MHz bandwidth limited oscilloscope and terminated each output with a 0.47uF capacitor at rated load and nominal line. (7) Hold up time is measured from the end of the last charging pulse to the time which the main output drops down to low limit of main output at rated load and nominal line. (8) Efficiency is measured at rated load and nominal line.